BDL Group provide plastering, dry lining, screeding and other sub-contract services to the construction industry. 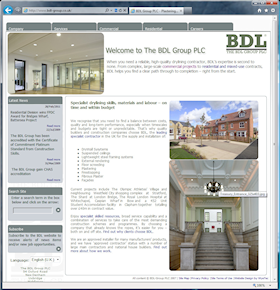 BDL's existing site was well coded, but did not reflect the size or professionalism of the company. BDL Group commissioned WyeTec to produce a site with a more corporate feel that was able to serve their needs both now, and in the future. 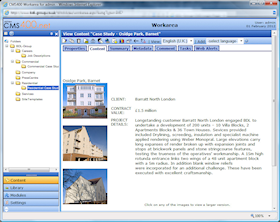 Based on an Ektron content management system, the BDL website presents details of the building contract services on offer, showcases current and previous projects, and provides a portal for attracting new contracts – and contractors. Additionally, we utilised some of the powerful new features offered by the Ektron CMS – such as the enhanced META data handling and the "Web Alerts" feature, whereby subscribers to the site can automatically receive notifications when new content is published. Professional photography and copy contributed considerably to add to the overall impact the site makes. To make the most of the content management system and to aid site administration, the web site is hosted on one of WyeTec's powerful low-contention web servers. Automated off-site back-ups ensure the ongoing safety and security of BDL's data. "Thanks for all your help, it's been a pleasure working with you." Contact WyeTec today to discuss how the Ektron Content Management System can add power and flexibility to your corporate website.